In a major speech last week on his administration’s counterterrorism policy, President Obama renewed his vow to close the prison at Guantanamo Bay where 166 detainees are still held. Obama was stymied from doing so in his first term by congressional opposition, and he acknowledged again that “the politics are hard.” But one near-certainty on which he can count is support from rank-and-file Democrats who have consistently backed him on this issue. In 2009, after Obama announced his plan to close the prison camp within a year, 59% of Democrats said they approved of doing so, according to a survey conducted near the end of his first year in office. By early 2012, after the administration had failed to close Guantanamo Bay, a Washington Post/ABC News poll showed about the same percentage (61%) of Democrats said they approved of the Obama administration’s decision to keep the prison open. By contrast, Republicans have been steadfast in their opposition to closing the prison camp at Guantanamo Bay. In 2009, Republicans disapproved of Obama’s plan to close the prison camp by a 75%-18% margin. In early 2012, a similarly large majority approved of the decision to keep Guantanamo open (79% approve). 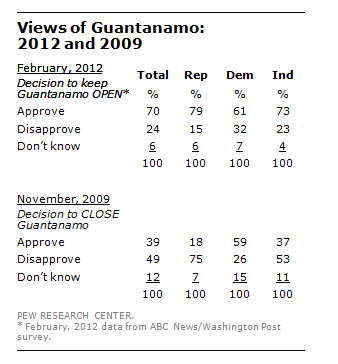 Independents have generally supported keeping Guantanamo open. In 2009, a slim majority (53%) opposed plans to close the base, and in 2012 an even larger majority (73%) approved of the decision to keep it open. Public opinion has not always translated into Obama getting the Democratic votes he needed on Capitol Hill to fulfill his longstanding promise to close Guantanamo – an illustration of the “hard” politics to which he referred in his speech. Democratic leaders in the Senate threw one of the obstacles in Obama’s way in May, 2009 when they stripped funds necessary for shutting down Guantanamo from a military spending bill, saying they wanted the administration to provide a more detailed plan about what would be done with the prisoners.